Halou produce a particular lush and complex sound, mixing the organic elements of voice and cello with electronic noises and beats. It's a downbeat but powerful sound that's largely seductive except for one slight problem. That problem is� I've heard it all before. Starting with 'Milkdrunk', the comparison with the Cochteau Twins is undeniable. The second track, 'Wiser' is more electronic and replaces the Cochteau Twins sound with Stina Nordenstam. 'Him to me' is more rocky and sounds really like early Curve, with washes of distorted guitar and a breathless husky vocal sound straight out of the Toni Halliday book. And on it goes, mixing these three sounds together without really creating something new. There's nothing that spoils a CD more than when the music fails to distract the reviewer from the game of spot the influence, and this doesn't. It's good, it sounds really nice, but it's impossible to get past the fact that it sounds so much like other people. 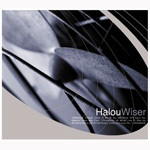 Halou really need to move beyond their influences and try to come up with something new, they have the potential but, on the basis of "Wiser", just haven't reached it yet.